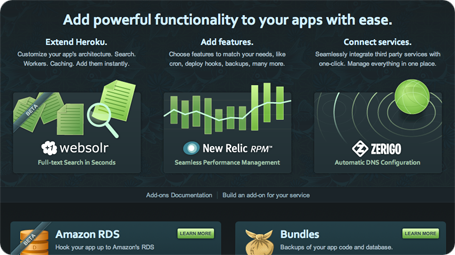 Heroku has focused since day one on making the end-to-end application experience as easy as possible. From our git focused workflow to the automated management of deployed applications, we’ve worked hard to give developers the flexibility to build amazing apps. Today we’re excited to announce a major extension of this flexibility with Add-ons. Add-ons are a way to extend your application. They can provide core functionality (like full-text search or cron), add features to the platform (like deploy hooks or backup bundles), and integrate with amazing third party services (like Zerigo, Sendgrid, or New Relic). 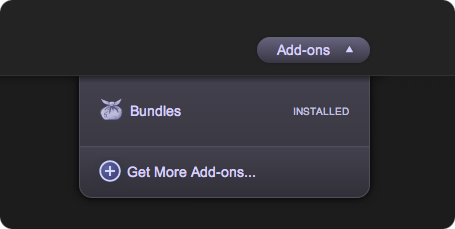 Detailed information for the initially available add-ons is available at addons.heroku.com. All available add-ons can be viewed in the add-on catalog. We have a combination of Heroku developed and 3rd party add-ons that cover a wide range of needs, and more coming all the time. You’ll also see some marked “beta” (open to anyone but not yet 100% production), some marked “private beta” (by request only – contact us at beta@heroku.com if you want to be considered for inclusion), and finally some marked “soon” (a sneak peak of some upcoming add-ons). We promise, this is just a glimpse of many many more to come. Adding an add-on is incredibly easy. You have the choice to either use our command line interface or the catalog. Simply click the add button, choose which app you want to add to, and you’re done. You will see the add-on being installed into your app in real time. All of an app’s add-ons can now be managed in one place – the add-on menu shown above. From the My Apps section, choose an app and then click the “Add-ons” button in the upper right corner. Select an add-on from the menu to view its interface, manage its configuration, or remove it. Lots more add-ons to come – stay tuned!